The aim of root canal treatment is to achieve chemomechanical debridement as well as filling the entire root canal system. 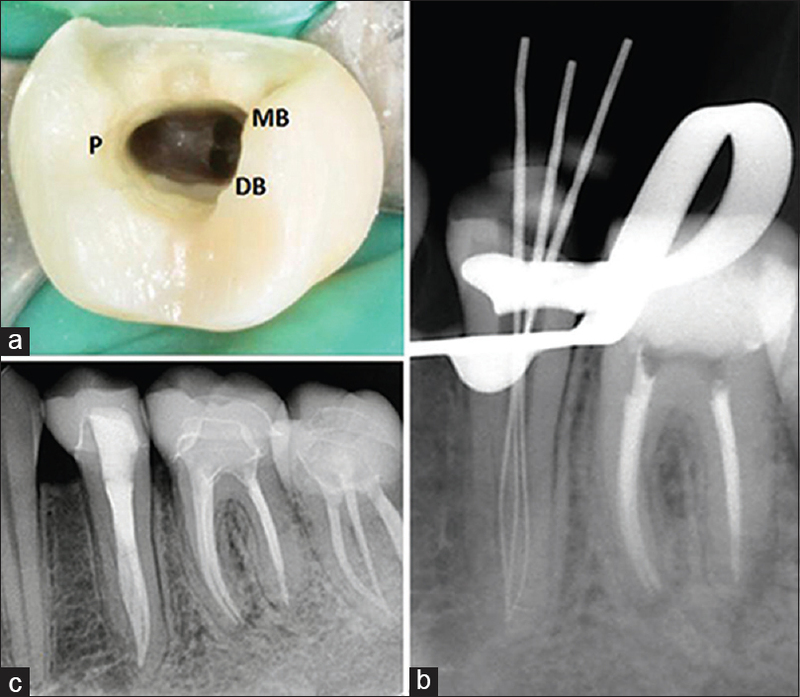 Failure to perform that may lead to future complexity, such as missing canal and/or posttreatment disease., Therefore, a thorough understanding of internal and external root morphology of the teeth is crucial for successful endodontic treatment. Mandibular premolars considered as the most difficult teeth for root canal treatment because of their aberrant root canal system. Different studies revealed the correlation between gender and ethnicity with anatomical variations and complexity of root canal morphology in particularly mandibular second premolars. Serman and Hasselgren reported that the occurrence of having a multiple canal system and roots in mandibular premolars has a lower prevalence percentage of a female in comparison to male. Vertucci and Zillich and Dowson reported the incidence of having three canals in mandibular second premolar to be 0.0% and 0.4% respectively. This case report presents diagnosis and successful nonsurgical endodontic treatment of a mandibular second premolar having an unusual occurrence of Sert and Bayirli's canal Type IX canal configuration and CBCT axial view has identified the C-shaped root canal morphology. A 26-year-old Saudi female patient with no history of any systemic disease present to the clinic of Prince Abdulrahman Advanced Dental Institute, Riyadh, Saudi Arabia for full comprehensive treatment of her teeth. An initial dental examination revealed deep occlusodistal caries in the mandibular left second premolar (#35). Radiographic evaluation revealed normal periodontium and the presence of multiple roots [Figure 1]a. CBCT was obtained from the patient to confirm root numbers and canals of the offending tooth. The CBCT was carried out using three-dimensional scanner planmeca ProMax (Planmeca Oy, Helsinki, Finland) and confirmed the presence of the two roots buccal and lingual with three canals were found, at the middle third two of the canals were in the buccal side “mesiobuccal (MB) and distobuccal (DB)” while the third one was in the lingual root [Figure 1]b. The axial image of the CBCT image also yielded a root canal morphology resembling C-shape configuration [Figure 1]c.
After clinical and radiographic examination, the tooth was diagnosed initially as reversible pulpitis with normal periapical tissue. Inferior nerve block was given with 2% lidocaine and 1:10000 epinephrine then rubber dam was applied. After caries excavation, pathological pulp exposure was encountered. A nonsurgical root canal treatment was decided accordingly. The final pulpal diagnosis was changed to be asymptomatic irreversible pulpitis with normal periapical tissue. Access cavity was carried out under a dental operating microscope (MÖLLER–WEDEL International, Haag-Streit Surgical GmbH, Germany) to be modified in a triangular-shape to accommodate straight-line access for all canals [Figure 2]a. By using electrical apex locator (Root ZX, J. Morita, Kyoto, Japan), the working length was obtained and confirmed radiographically [Figure 2]b. The biomechanical phase was accomplished with protaper universal files (Dentsply, Maillefer, Ballaigues, Switzerland) up to size F3, besides the use of copious irrigation of 5.25% sodium hypochlorite in all steps. The canals were dried with sterile paper points and then filled with gutta-percha cones with lateral condensation technique and AH-26 sealer (Dentsply Maillefer, Ballaigues, Switzerland). Finally, the access cavity was filled with a composite filling (ChemFil, Dentsply Detrey, Germany) and restored with full-coverage crown [Figure 2]c.
Detection of morphological variations needs a careful interpretation of different angulated preoperative periapical radiographs., In general, in the mandibular premolars having three canals, the cervical part of that root is wider than the usual situation, with a little or mostly no taper. Root canal morphology variations were classified by Vertucci into eight types, whereas Sert and Bayirl extended Vertucci classification by adding 14 types of root canal configurations. The literature described the occurrence of Sert and Bayirli's Type IX root canal configuration and endodontic treatment as rarely documented.,,,, Several authors had reported that the pulpal floor in the mandibular second premolar with three canals has two orifices in the buccal side (MB and DB) and one orifice lingually.,,, The current report showed a similar pulpal map. Currently, utilizing the advanced radiographic techniques such as CBCT is very helpful to explore the internal and external morphological variations.,, CBCT had the capability of providing images with high diagnostic quality that has shorter scanning times and lower dosages in comparing to the conventional computed tomography (CT) scans. It is a noninvasive three-dimensional reconstruction imaging used as a practical tool in morphological analysis and endodontic applications. Two in vitro studies extensively analyze and describe the Type IX anatomic configuration of the root canal system in mandibular premolars by using microcomputed tomography., The evaluation of internal anatomy showed the occurrence of 7.8% in mandibular first premolars Type IX configuration, while the greater percentage of 16.2% was reported when mandibular premolar specifically had radicular grooves. Teeth had radicular grooves more often to the attendant with complex and multiple canal morphologies, besides that they had a greater incidence of complicated root anatomies than single and simple canals. Therefore, the availability of radicular grooves anatomies may influence the morphology of the root canal. These results substantiate with this clinical case report, where the presence of a radicular groove was detected in the CBCT with variable root canal morphology. Ordinola-Zapata et al. reported that the mandibular premolars with three root canals are characterize by the presence of the pulp chamber as triangle-shaped, in which MB orifice distances to the lingual orifices are the greatest. The use of dental operating microscope will enhance a better visualization to locate an extra canal. Moreover, fiber optic illumination, magnifying loops, 1% methylene blue staining technique and the bubbling effects with sodium hypochlorite might be useful in the exploration of additional canals. This case report adds an extra confirmation for the considerable rare morphology of Sert and Bayirli's canal classification Type IX in the second mandibular premolar. The preoperative radiographic images, a correct outline of the access cavity, as well as the proper inspection of pulpal space all, are highly important for diagnosing and treating cases of internal morphological variations. Friedman S. Prognosis of initial endodontic therapy. Endod Topics 2002;2:59-88. Serman NJ, Hasselgren G. The radiographic incidence of multiple roots and canals in human mandibular premolars. Int Endod J 1992;25:234-7. Zaatar EI, al-Kandari AM, Alhomaidah S, al-Yasin IM. Frequency of endodontic treatment in Kuwait: Radiographic evaluation of 846 endodontically treated teeth. J Endod 1997;23:453-6. Alfawaz H, Alqedairi A, Alkhayyal AK, Almobarak AA, Alhusain MF, Martins JNR, et al. Prevalence of C-shaped canal system in mandibular first and second molars in a Saudi population assessed via cone beam computed tomography: A retrospective study. Clin Oral Investig 2018;1-6. Ordinola-Zapata R, Bramante CM, Villas-Boas MH, Cavenago BC, Duarte MH, Versiani MA, et al. Morphologic micro-computed tomography analysis of mandibular premolars with three root canals. J Endod 2013;39:1130-5. Zhang D, Chen J, Lan G, Li M, An J, Wen X, et al. The root canal morphology in mandibular first premolars: A comparative evaluation of cone-beam computed tomography and micro-computed tomography. Clin Oral Investig 2017;21:1007-12. Zoya-Farook A, Abhishek P, Shahabadi A. Cone-beam computed tomographic evaluation and endodontic management of a mandibular first premolar with type IX canal configuration: Case report. J Endod 2017;43:1207-13. Sagale AA, Ramugade MM, Ganga R. Endodontic management of mandibular second premolar with type IX canal configuration using cone-beam computed tomography as a diagnostic aid: A rare case report. Contemp Clin Dent 2018;9:S180-4. Cohenca N, Simon JH, Roges R, Morag Y, Malfaz JM. Clinical indications for digital imaging in dento-alveolar trauma. Part 1: Traumatic injuries. Dent Traumatol 2007;23:95-104. Liu N, Li X, Liu N, Ye L, An J, Nie X, et al. Amicro-computed tomography study of the root canal morphology of the mandibular first premolar in a population from Southwestern China. Clin Oral Investig 2013;17:999-1007. Fan B, Yang J, Gutmann JL, Fan M. Root canal systems in mandibular first premolars with C-shaped root configurations. Part I: Microcomputed tomography mapping of the radicular groove and associated root canal cross-sections. J Endod 2008;34:1337-41. Chen J, Li X, Su Y, Zhang D, Wen X, Nie X, et al. Amicro-computed tomography study of the relationship between radicular grooves and root canal morphology in mandibular first premolars. Clin Oral Investig 2015;19:329-34. Al-attas H, Al-Nazhan S. Mandibular second premolar with three root canals: Report of a case. Saudi Dent J 2003;15:145-7. Alenezi MA, Tarish MA, Alenezi DJ. Root canal treatment of three-rooted mandibular second premolar using cone-beam computed tomography. Saudi Endod J 2015;5:187-90. Al-Abdulwahhab B, Al-Nazhan S. Root canal treatment of mandibular second premolar with four root canals. Saudi Endod J 2015;5:196-8. Al-Fouzan KS. C-shaped root canals in mandibular second molars in a Saudi Arabian population. Int Endod J 2002;35:499-504. De Carlo Bello M, Tibúrcio-Machado C, Dotto Londero C, Branco Barletta F, Cunha Moreira CH, Pagliarin CML, et al. Diagnostic efficacy of four methods for locating the second mesiobuccal canal in maxillary molars. Iran Endod J 2018;13:204-8. Albuquerque D, Kottoor J, Hammo M. Endodontic and clinical considerations in the management of variable anatomy in mandibular premolars: A literature review. Biomed Res Int 2014;2014:512574.